TORONTO — Before the Toronto Raptors tipped off against the New York Knicks on Monday, coach Nick Nurse was looking forward to finally having a healthy roster. He figured it would all come together in the next couple of games. A few hours later, the coach was eating those words after the Raptors lost all-star Kyle Lowry to an ankle injury — again — in their 128-92 rout of the Knicks. "Maybe I shouldn't have said that. Can we get a wood podium up here?" Nurse said at the post-game press conference. Jeremy Lin scored 13 of his 20 points — his best game as a Raptor — in the fourth quarter, with the game well in hand, leading eight Toronto players in double figures. But Lowry's injury cast a pall on the night. Lowry had just returned after missing two games with a left ankle injury, but he injured his right ankle when New York's Mitchell Robinson knocked him over from behind with 5:15 to play in the third. Lowry slapped the floor in pain before being helped up. The guard glared at New York's bench before being helped to the locker-room. Mitchell fouled out a couple of minutes later, after playing just 14 minutes. "It's pretty sore, it's tender right now," Lowry said after the game. "I watched the clip. I think it was a little bit dirty. He grabbed me and pulled me down but he's a young kid . . . I know he didn't think he was going to hurt me, I think he was trying to stop the play." Pascal Siakam had 19 points, Lowry had 15 and eight assists, OG Anunoby had 14 points, Fred Van Vleet chipped in with 12, Marc Gasol had 12 points to go with 11 rebounds, and Norm Powell finished with 10 points for Toronto (50-21). The Raptors were playing without star Kawhi Leonard, who sat out for load management as has become routine when the team plays on back-to-back nights. Allonzo Trier had 22 points to top the Knicks (14-57). Between injuries to key players, the arrival of Marc Gasol and Lin at the trade deadline, and Leonard's load management, Nurse has used a revolving door of rosters. Monday night's was his 20th different starting lineup of the season. "It's super frustrating for our team but we've done a great job of handling everything and playing through the injuries and rest games and trying to keep everyone together," Lowry said. "Everything's been kind of up and down. But we're a good team, and all we need is a couple of games on the floor together and we'll be all right." Despite yet another new group of starters, and against the worst team in the league, Toronto's offence hummed like a well-oiled machine from the opening tipoff. The Raptors shot a sizzling 82.4 per cent in the first quarter, and their 73 points in the first half was a season high. Toronto had compiled a 35-point lead in the third quarter and led 101-69 with one quarter to play. "Toronto is going to be in the mix at the end, they have all the ingredients to go after this thing," said Knicks coach David Fizdale. "We took one on the chin tonight." The Raptors' bench built their advantage to 38 points in the kind of fourth quarter that makes fans wish the playoffs would come already. And with a few minutes to play, the courtside seats at Scotiabank Arena were virtually empty. Barely half the capacity crowd of 19,800 was still on hand to cheer the Raptors off the court at the final buzzer. VanVleet was playing just his second game back after a month off with a thumb injury. His return is fortuitous timing with Lowry's next few games questionable. The fact the Raptors are No. 2 in the Eastern Conference despite the ever-changing rotation, VanVleet said, shows the team's depth. "Yeah, it's unfortunate," he said. "But I think that is a testament to our team showing what we are capable of. We've had our best player (Leonard) out for almost half the year. Kyle has missed a month (earlier in the season with a back injury). I've missed a month, and it's kind of all going at the same time. "It's unfortunate, but let's get them all out of the way now and in a month and a half hopefully we'll all be good to go." The Raptors were coming off a disappointing 110-107 loss in Detroit a day earlier — making it a 3-0 sweep by former coach Dwane Casey and his Pistons. The Knicks' only lead Monday was in the first two minutes of the game, and by the time VanVleet converted a three-point play with a minute left in the first quarter the Raptors were up by 13 points. Toronto took a 38-29 advantage into the second. 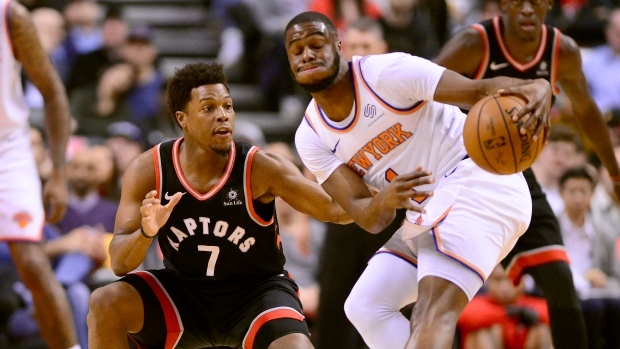 The Raptors held the Knicks to 29 per cent shooting in the second, and stretched their lead to 20 points on a VanVleet three-pointer late in the second, and Anunoby's three-pointer at the buzzer sent Toronto into the halftime break with a 73-54 advantage. The Raptors play in Oklahoma City on Wednesday then host the Thunder on Friday. With 11 games to go in the regular season, they're the only games against teams with winning records the Raptors have left.